This is our crazy, nerdy, wild, fun, geeky, humorous, loving family. From left to right, me (Amy, aka Mom), Terrance, Harley, Todd (aka Dad, or Blue Chip), Reagan, Emma, and Jordan. 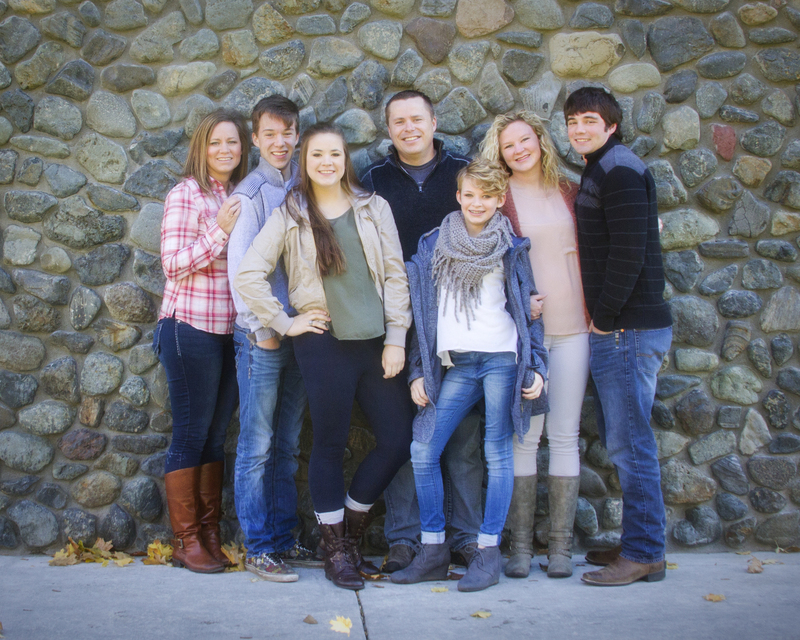 Todd and I feel lucky every day that we have these five amazing people in our lives, and that we have the responsibility of raising them to be productive, caring members of society. Emma has embarked on her own new journey, and she and Jordan will be married in May. It is so weird to say I have a child getting married because I don’t feel like I am old enough to have a kid that is old enough to get married, but at 21, she is definitely old enough. Jordan is amazing, and we love him! He treats Emma like a queen, but he doesn’t let her railroad him either. They are so good for and to one another. Harley is the same fun-loving, wear your emotions on you face, laid back person she has always been. She loves sports, but continuously laments her lack of bruises – not that she doesn’t get them, she just never gets a physical bruise like a “battle scar”. She is blunt and honest to a fault, and you never have to wonder where you stand with her. Harley’s heart is big, and she feels deeply, though she hides it well behind a wall of sarcasm and humor. I admire her perseverance and determination to remain true to herself and the person she wants to be. If The Man had a goofier younger clone, Terrance would be it. He is loving, compassionate, and hard working. He is always full of humor, jokes (at times inappropriate), and laughter. He loves gaming, and at 16 has a busier social life than the rest of us put together. He is passionate about snowboarding, and as started driving up to the mountain on his own, which is awesome. Terrance is truly one of the best kids I’ve ever had the privilege to know, and I get to have him in my life every single day. The baby of the family, Reagan, is probably the most noticeable. She is gregarious, funny, energetic, and is like a little sprite bouncing from one thing to the next. She constantly keeps Todd and me on our toes, and she frequently tests the limits – not to break the rules as much as to try to keep up with the older kids. Reagan is at a great age, she still loves to hang with Todd and me, but she is starting to explore her social network, as well. She makes friends with everyone she meets, and she could charm the pants off Ebeneazer Scrooge in a heartbeat. I hope she never loses her spirit and sense of adventure. Like I said at the beginning, Todd and I feel pretty lucky that we get to be part of these wonderful lives, and we are blessed with amazing kids!